I haven't updated this in a very long time, I'm pretty sure nobody would care to watch this, so it makes the perfect storage spot for my newest piece. 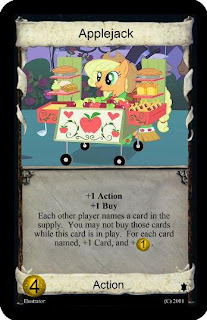 Behold, Dominion now has ponies! This set has gone through numerous revisions through playtesting. The latest version of the set will always appear right here. I'm also looking for help on the template graphics. The friendship mechanic is supposed to warrant a pink template, but the program I use doesn't allow for that. I'd also want Derpy's template to be a combination of blue, pink, and orange. If you feel you can accomplish this, please let me know.